Helen Clifford, Francois Carli, Kevin Coates and Nel Romano, Kevin Coates A Hidden Alchemy Goldsmithing: Jewels and Table-Pieces, Arnoldsche, p. 66, 70 and pp. 268-269, illustrated pp. 72-73 and 268-269. John Andrews and Derek Styles, Designer British Silver from the Studios Established 1930-1985, Woodbridge, 2015, pp. 142-143, illustrated p. 143. Kevin Coates was born in Surrey and from an early age had an interest in both art and music. He became an accomplished instrumentalist giving regular concerts, later with his wife Nel Romano, with whom he formed the Duo Vinaccia in 1974. His training as a goldsmith began at the Central School of Arts and Crafts and continued at the Royal College of Art. In 1979 he was awarded a doctorate of philosophy for his study of the use of mathematics and sacred geometry in musical instrument design, a work since published by Oxford University Press. 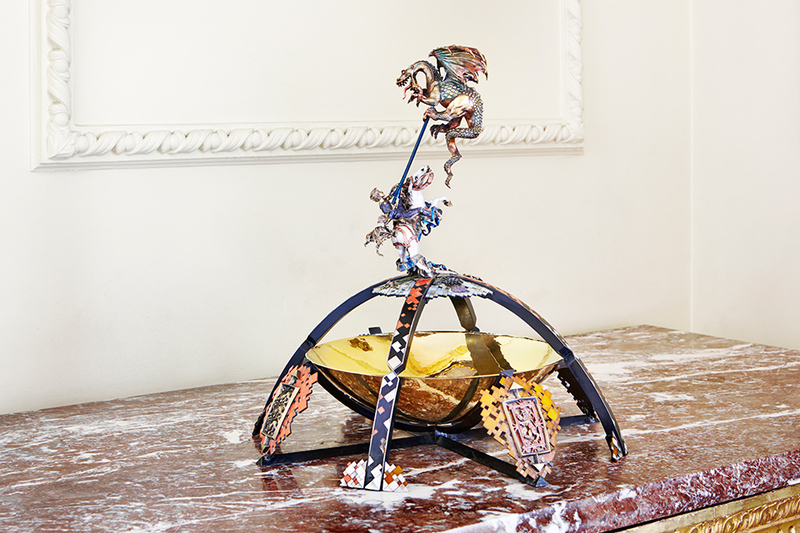 His jewellery and table-pieces are in private and public collections throughout the world. Notable commissions include the Amity Cup for the Goldsmiths’ Company, the Carrington Cup for the Victoria and Albert Museum, a large centrepiece for Leeds Castle, a rose-water dish for Lord Nelson of Stafford, a paperweight for the Prince of Wales and the St Chad Cup for Lichfield Cathedral.